A wise and richly symphonic first novel, Long for This World is a thoroughly contemporary family drama that hinges on a riveting medical dilemma. Dr. Henry Moss is a dedicated geneticist who stumbles upon a possible cure for a disease that causes rapid aging and early death in children. Although his discovery may hold the key to eternal youth, exploiting it is an ethical minefield. Henry must make a painful choice: he can save the life of a critically ill boy he has grown to love — at the cost of his career — or he can sell his findings for a fortune to match the wealth of his dot-com-rich Seattle neighbors. Henry turns to his family for support, and in their intimately detailed lives unfolds a story of unforgettable characters grappling with their own demons. Michael Byers’s story collection The Coast of Good Intentions won the Sue Kaufman Prize for First Fiction from the American Academy of Arts and Letters and was a finalist for the PEN/Hemingway Award. 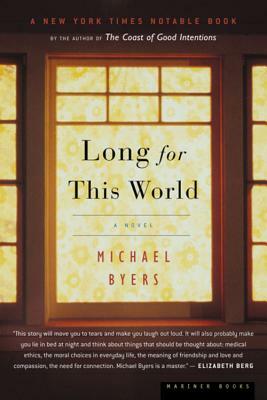 Long for This World was featured on the History Channel's “Mavericks, Miracles, and Medicine.” The recipient of a Whiting Foundation Writer’s Award, Byers lives in Pittsburgh with his wife and two children.